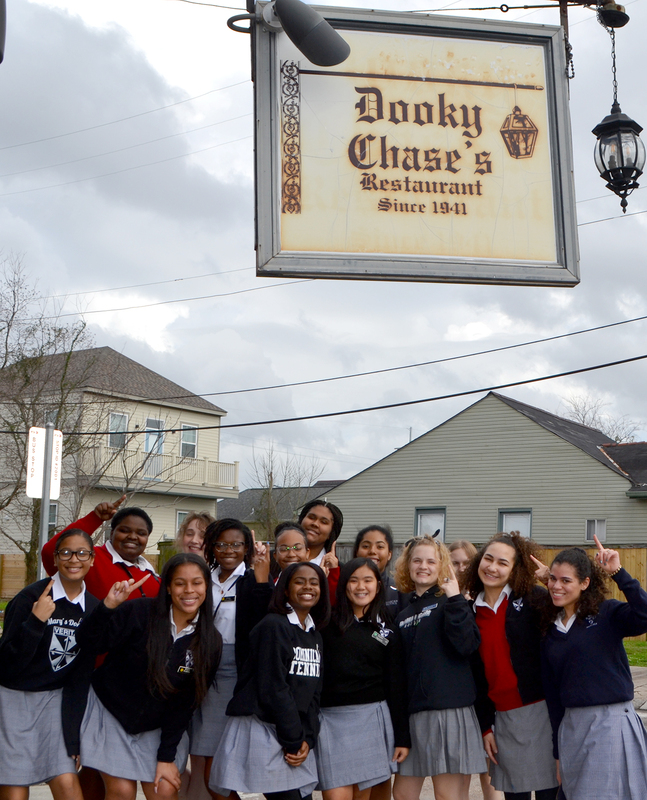 A visit to Dooky Chase’s Restaurant at 2301 Orleans Avenue in Treme included a serving of the restaurant’s signature creole cuisine and history lessons to students in the Students for Human Dignity and Diversity in Action organization. Joining them were organization co-moderators Dr. Maureen Wright (Chair, Dominican’s Board of Directors) and Vallerie Maurice (Coordinator, Unity in Diversity), Dr. Cynthia A. Thomas (Dominican President), Jamie Lassere (Advancement Vice President), Katey Alexander (Dean of Student Services), and Paul Spitzfaden (Director of Athletics). 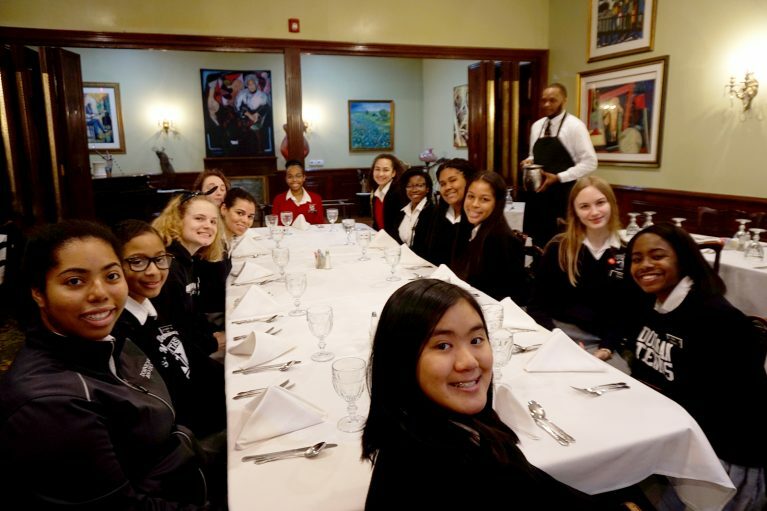 After reading about the restaurant’s current owner Mrs. Leah Chase on the NOLA4Women website, Dr. Thomas suggested the visit to Ms. Maurice. 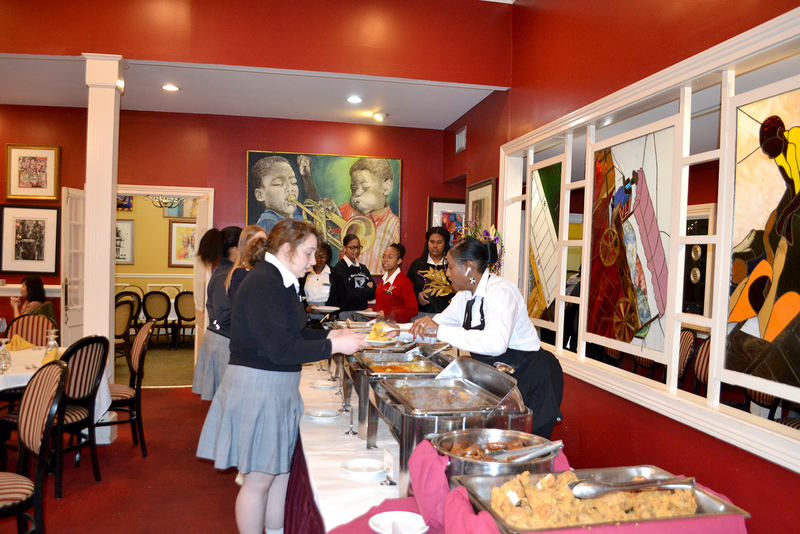 “When I told the students about dining in one of the restaurant’s private rooms and Mrs. Chase who is a world renowned chef, civil rights activist, author, and philanthropist, it wasn’t hard to get a quick list of students together,” said Ms. Maurice, who’s first requested celebration visit to Dooky Chase’s was a family gathering to honor her graduation from kindergarten in May 1965. The field trip, part of Black History Month observance, was supported by a monetary gift that Dr. Thomas received from the Dominican Sisters at the time that she was presented with the St. Martin de Porres Award from the Southern Dominican Province of the Dominican Friars. The award recognizes individuals who are dedicated to the mission of the Dominican Order and who emulate St. Martin’s spirit of compassion, mercy, and the search for truth. St. Martin de Porres is the patron saint of social justice. 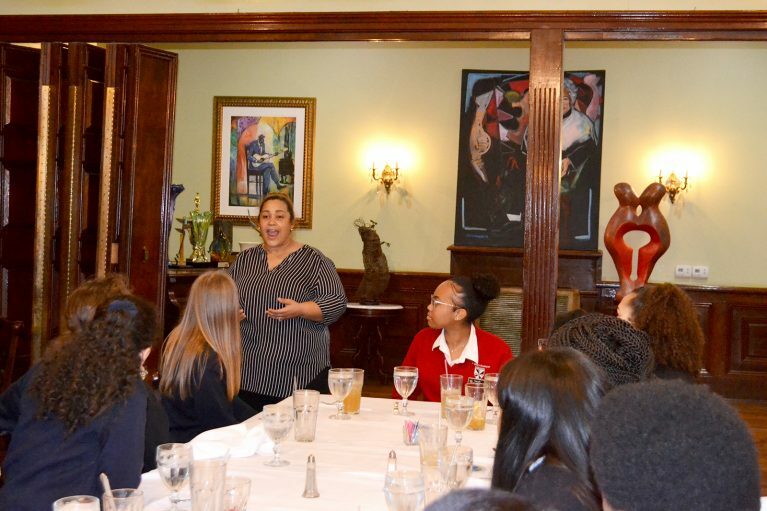 Tracie Griffin, granddaughter of Mrs. Leah Chase, greeted the group and shared with them the story about the family-owned and operated restaurant that has served generations of New Orleans families. Locals and tourists are among its clientele, as well as politicians, musicians, artists, and authors. President George W. Bush and President Barack Obama have both enjoyed meals at the establishment that also has an extensive African-American art collection, begun by Mrs. Chase. In 1946, Edgar Dooky Chase, Jr., married Leah Lange Chase who became known as the Queen of Creole Cuisine. The couple hosted black voter registration campaign organizers and other civil rights leaders. Before the United States Supreme Court reversed its 1896 decision, Plessy v. Ferguson, Dooky Chase’s was the place for discussing civil and economic rights in the African American community in New Orleans and the country. During the 1960s, the restaurant was among the few public places in the city where African Americans could meet and discuss strategies during the Civil Rights Movement. Among those who gathered, there were Lionel Collins, Revius O. Ortique, Jr. (Judge, Louisiana Supreme Court Justice) and later freedom fighters such as Reverend A.L. Davis, Reverend Avery Alexander, Oretha Castle Haley, Rudy Lombard, Virginia Durr, and Jerome Smith. Martin Luther King, Jr. and others would join these local leaders for strategy sessions and dialogue over meals in the upstairs meeting room. Alexander Pierre Tureaud, Sr., known as A.P. Tureaud was the attorney for the New Orleans chapter of the NAACP. With the assistance of fellow attorney Thurgood Marshall (later Associate Justice of the Supreme Court of the United States, October 1967 – October 1991) and Robert Carter from the NAACP Legal Defense and Educational Fund, A. P. Tureaud filed the lawsuit that successfully ended the system of Jim Crow segregation in New Orleans. Ernest “Dutch” Morial (the first African-American mayor of New Orleans from 1978 to 1986) met with other local leaders at the restaurant at meetings in the restaurant’s upstairs rooms where Mrs. Leah Chase served gumbo and fried chicken. The restaurant was key when Martin Luther King Jr. and the Freedom Riders organized their bus boycott in Montgomery, inspired by the ones in Baton Rouge. Local officials were aware of these meetings, considered illegal at the time. However, city and local law enforcement could not stop them or close the doors of Dooky Chase’s because of the risk of public backlash. “The significance of Mr. and Mrs. Chase’s activist work was their willingness to hold meetings in that upstairs room for civil rights leaders at a time in our society when it was illegal to do so. Those early meetings formed what is known today as the Southern Christian Leadership Conference. It all began at Dooky Chase’s,” noted Ms. Maurice. The Chase family continues their commitment of supporting the community and honors Dooky and Leah Chase, saluted as catalysts for change. 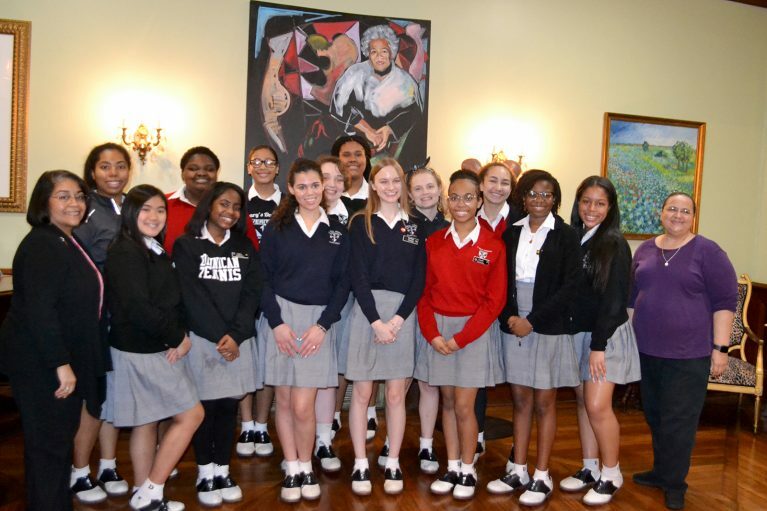 The Edgar “Dooky” Jr. and Leah Chase Family Foundation cultivates and supports historically disenfranchised organizations by making significant contributions to education, creative and culinary arts, and social justice.